A ministry of the Presbyterian Church in Canada, Evangel Hall enables the distressed of Toronto's inner city to achieve their potential through a Christian ministry of service, programs and advocacy designed to nurture self-esteem and human dignity. 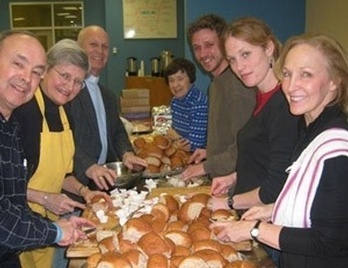 Friends and members of RPC visit the hall regularly to prepare a meal, eat with the Hall's guests, and join together in a service of worship following the meal. To become involved in volunteering with Rosedale's team at Evangel Hall, or to find out more, please contact Sandy Johnston or call the church office at 416.921.1931.